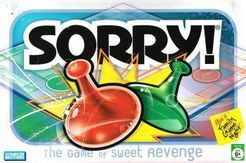 Buy Sorry and PriceWatch, Buy this board game at the Lowest Price. Choose four pawns of the same color. Put all four on that color START space. Shuffle the deck. Place face down on "Place Pack Here" to form the Draw pile. Pick a player to go first. Movement is clockwise around the board (unless instructed otherwise!) and play passes to the left. On all turns, take the top card on the Draw pile and move accordingly (see "The Cards", right) if you can. Place the card face up on "Discard Here". Note: If it's your first turn and you do not draw a card that lets you start a pawn out, you forfeit (skip) your turn. To move a pawn from your START out onto the track, you must draw either a 1 or a 2. If it is a 2, do as it says, then draw again and move if possible. You may not start a pawn out with any other cards! You may jump over your own or another player's pawn that's in your way, counting it as one space. BUT... if you land on a space that's already occupied by an opponent's pawn, BUMP that pawn back to its own color START space. 4 and 10 cards move you backwards. If you have successfully moved a pawn backwards at least two spaces beyond your own START space, you may, on a subsequent turn, move into your own SAFETY ZONE without moving all the way around the board. Two pawns of the same color may never occupy the same space. If your only possible move would make you land on a space already occupied by another of your own pawns, you forfeit your turn. If at any time you cannot move, you forfeit your turn. But if at any time you can move, you must move, even if it's to your disadvantage. If you run out of cards in the Draw pile, shuffle the Discards and use them. If you get all four of your pawns HOME first, you win! If you play again, the winner goes first.